Edit 15/04/2018: Supercharger has closed in the past week. We might be developing a very specific Supercharger habit - our second visit also served as an early Friday night dinner before hitting the nearby cinema. Though we were now familiar with their paper-and-pencil ordering approach, we still took some time to mull over the options available to us. There'd been a few minor swaps in the menu and we did our best to mix new offerings with the dishes we were sad to miss the first time around. Keen to base my meal on the mashed potato with mustard seeds, I elected for the India-themed dishes - dahl ka deewana (pictured above, centre), chickpea chole (front left), fermented carrot with cumin seeds and a coconut yoghurt-based raita (main bowl; $12.80). The carrots weren't overly pickley and tasted more of caraway than cumin to me, but I'd gladly recommend all the other components: the potatoes were fluffy, the raita sweet and cooling, the chole all warmly spiced sweet'n'sour tomato, and the dahl like a low-fat dahl makhani, with four kinds of legume and many more spices besides. A carrot, orange, ginger and cardamom blast (tall jar; $7.80) proved refreshing and complementary. Michael started with steamed quinoa, '10 sec. broccoli w sweet tamari & ginger dressing' and a disconcertingly grey but actually-very-tasty cauliflower, black turtle bean, turmeric and curry leaf smash. There were even louder flavours in the tofu simmered in tom yum broth, and the carrot & bean khadi with coconut, turmeric, lemongrass, galangal & lime ($12.80 all up). Our second Supercharger experience reinforced everything we learned on our first - the food is fresh, nutritious, generously portioned and reasonably priced - not something we habitually encounter in the city. You can read about our first visit to Supercharger here. Since then it's received blog love from Veganopoulous, quinces and kale and The Good Hearted. Accessibility: The entry from Emporium is flat and wide. All ordering options are visible from low counter height; we ordered and paid at this counter. We picked up food from a high bench, though I'm sure accommodations could be made. Toilets are elsewhere in the Emporium complex. We had big plans for New Years Eve this year, so I knew we needed some similarly big plans for our first breakfast of the year. Cindy had a tough 'holiday' period, basically working the whole way through, so I took it on myself to give her a delicious January 1. For breakfast dessert I went back to the lemon & blueberry loaf that Cindy had made last summer, but to start the meal off I wanted something savoury and hearty enough to soak up any hangovers we may have accrued. Isa Does It had just the recipe, with a title consisting of three perfect words: chipotle. sausage. hash. What more could you ask for post-party than a big pot of spicy mush, loaded with potatoes and mock snags, with a a few green bits and pieces on top to deal with any foolish new year's resolutions you might have made? It was perfect. It's really easy to make, although the spuds require a bit of patience - you need them to be cooked through (ours were a tiny bit underdone because I was tired, hungry and impatient). The miso/tahini dressing provides some creamy, umami-ish richness, but it's really all about eating a big bowl of spuds, sausages and chilli. Heat a tablespoon of the oil in large saucepan. Throw in the potatoes and salt and cook for 10-15 minutes, covered. Stir the spuds up every 2 minutes or so - you want to try to get them crispy on the outside without having them stick to the pan. While the potatoes are cooking make up your dressing - just whizz all the ingredients up in a food processor or blender. Throw the onions and the rest of the oil in with the potatoes and cook everything for five minutes or so, until the onion is cooked through. Add the sausages, coriander, oregano and curry powder and cook for a couple more minutes. Add the chipotles and lime juice, stir everything together and kill the heat. Taste and add salt and pepper as required. Serve, topping with chunks of avocado and garnishing with coriander leaves. We saw the new year in at our friends' home; sharing a potluck, watching Footloose and trading favourite online dance videos. The lowest common dietary denominator was vegan and gluten-free, so I decided to remake the Veganissmo ginger cheesecake slice for this different crowd. A few days earlier our hosts had given Michael and I a lovely homemade Christmas gift of jarred condiments and a retro serving plate. I put them to good use here, stirring a jar (approx 1 cup) of lime and ginger marmalade into the cashew batter instead of lining the cake with crystallised ginger. It worked a treat, and looked all the cuter on that sweetly patterned platter. I can see myself making and making-over this recipe again and again - the sandy buckwheat base and dense creamy topping are just to my taste. Given it's vegan, gluten-free, easy to slice and feasible to transport, this is a great go-to for picnics and potlucks. Summer city errands are a nice excuse for a city lunch - something we don't do very often. Last year Johanna claimed that Gekkazan has the best vegetarian sushi in Melbourne, so we confirmed that it was open and headed on over. We were relieved to discover that this didn't require entering GPO/H&M; rather, it's tucked away on Postal Lane and best approached from Little Bourke St.
Gekkazan certainly does sushi - there's an extensive selection of rolls, onigiri and inari. In many cases the nori is wrapped separately for a crisper roll-your-own experience. Michael positively rated the ready-rolled chilli-fried tofu with black rice, and the vegetarian-croquette-with-lettuce stuffing ($2.90, both pictured above). If you're willing to wait a little longer, there's also a menu of cooked-to-order meals. The options were a little narrower than we'd hoped - there's currently no vegetarian bento, and the vegetable noodle soups contained chicken stock. There were, however, gyoza ($8.90) - their conjoined skin was intriguing but the filling was a less innovative vegetable mash. My agadashi tofu donburi ($14.90) was probably our best selection. The lightly-battered tofu cubes were smothered in a thick savoury gravy with a hint of ginger, and tender slivers of carrot and shitake mushroom; the rice was expertly formed and seasoned. There was a bounty of sides to pick at: seaweed and tofu nori rolls, a croquette sample, flour-dusted potatoes, steamed and fresh salad vegetables. I took my time browsing and delighting in each morsel. Gekkazan is a cityworker's lunch spot with long queues, fast service, dense seating and a lot of noise. But there's thought and skill evident in their food and their service - we were grateful to the smiling staff member who set us straight on the veg options. We were inspired to visit Gekkazan thanks to a review on Green Gourmet Giraffe. Reviews on other blogs are less effusive but still generally positive, see Let's Get Fat Together, Purple bowl, delightfully tasty, DAISYUM.COM, A Chronicle of Gastronomy (twice), ~~~Wild Mixed~~~, Gastrology and The Bonding Tool. Accessibility: Entry to Postal Lane and Gekkazan from the Little Bourke end is flat, and there are stairs at the Bourke St end. The corridor through the middle is reasonably clear, but the tables are very densely packed and the area is crowded at lunch time. We ordered and paid at a high counter. Signs pointed to gendered, parenting and wheelchair-accessible toilets elsewhere at GPO. It's a lovely time of year to eat outdoors. Though the ground is uneven and the tables small, the dappled sun out front of Acustico is a near-ideal spot for breakfast. They've changed up their menu since we last blogged about them - there's now bircher muesli, an avocado-quinoa salad that looks vegan-friendly, and a lunch menu with cheesy toasties, fancy salads and fresh baguettes. I was most pleased that the sweet breakfast option wasn't crossed out this time. My Brunswick bruncher sensibilities were ruffled by their choice to mix currants into ricotta pancakes ($15) and soup it all up with bananas, raspberries, yoghurt, hazelnuts and honey. It proved completely successful, equal parts fresh and filling, creamy and tart and toasty. I couldn't help noticing that iced chai ($4) now appears on the cold drinks menu - Acustico's rendition is a milky black tea served with lots of ice and ground cinnamon. The gluten-free quesadilla ($15) seems to be unchanged and an enduring favourite of our friend Dave. It's stuffed with smoked cheese and plentiful jalapenos then served with a salad of tomatoes, corn, onion and spinach. With some friendly egging on from Dave and our waiter, Michael added a poached one to his quesadilla plate ($3). Relaxed and extra-helpful service from the Acustico staff clinched this as an especially-good any-weekend kind of breakfast. The juice and toastie menus hint that it's a good 'un for lazy lunches too. You can read about our first visit to Acustico here. Since then it's been well received by fellow veg blogger Green Gourmet Giraffe, plus omni bloggers I Talk Too Much My Mouth Hurts, the melbourne local and BYEBYEMYTHYROID. Accessibility: There's a small step at the Union St entry but it's flat if entering from Railway Place. The front room is a little cramped, but things open out nicely in the back area; tables out the front are spacious but set on uneven ground. Ordering as at the table and you pay at a low counter. The toilet is unisex and narrow. 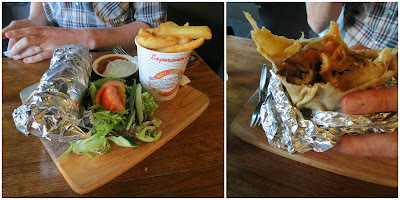 We had a sneaky non-blogged trip to The Cornish Arms in mid-December and finally stepped beyond the mains section of the menu to discover the vegan option of the spicy chicken wings ($13). They were so good that we were back soon after for a second shot at them. They're a basket of crispily fried mock-meat with a batter not too far removed from KFC hot and spicy and a creamy aioli that soothes the chilli burn. And they are so freaking delicious! Go. Go and order them at once. The only problem with ordering the chicken wings is that it really drives home how ridiculously big the main meals are. Still, we soldiered on - it was the holiday season after all. 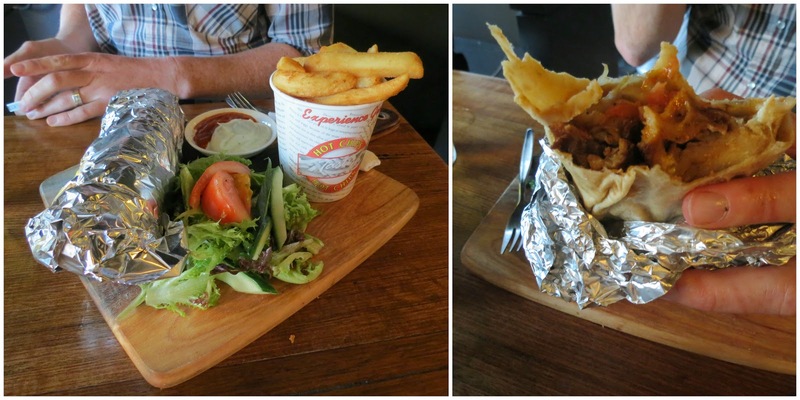 I tackled the stupidly gigantic vegan souvlaki - mock duck and chicken (both seitan-based) with salad, garlic sauce and chilli plus a bucket of chips and some tomato sauce ($20). My memories of this are slightly tainted by how full I was by the time I got through it all - the first few bites were out of this world: excellent mock meat, soaked in chilli, mayo-y sauce, but it gradually wore me down. I probably wouldn't recommend ordering this on top of the chicken wings, but on its own it's a pretty incredible meal. Cindy was smarter and looked to the more manageably-sized pizza menu, falling back on her faithful mock Hawaiian (strangely unblogged by us!). It's a combination of delicious mock-chicken and excellent facon with disgusting, sickening pineapple. Honestly, you pineapple pizza people are all monsters. Our dining buddy Clamps was more appropriate, ordering the chilli non-carne pizza, a modestly sized treat topped with beef and black bean chilli, corn chips, salsa, jalapenos, sour cream and a smattering of veggies. It looked amazing, but I was too far gone with my souvlaki to sneak a taste. Next time! The Cornish is a Melbourne vegan treasure - at least for vegans who embrace junky pub food. There's almost nothing healthy on the menu - it's all burgers, pizzas and mock meat - but that's sometimes what you need, and the Cornish is getting better and better at delivering it. The pub's generally got a good vibe (it depends a bit on whether or not there's an open mic night going on), the beer taps are always diverse and excellent - it's a real winner. Read about our previous visits to The Cornish Arms here and here. Since our last blog post, it's been reviewed positively from a vego perspective by I Spy Plum Pie, Veganopolous, easy as vegan pie and Little Vegan Bear and by omni-bloggers I talk too much my mouth hurts, makelovetotheworld and A Chronicle of Gastronomy, who all enjoyed the food, although the latter two were let down by slow service. Accessibility: There's a flat entryway and a pretty spacious interior. Lighting is low without being ludicrously dim. Ordering and payment happens at the bar. The toilets are on the same level and are wheelchair accessible. We hosted a small Christmas gathering at our place this year - just us and a handful of family members picnicking in the park. Even with just a small group, we figured Christmas was the perfect excuse to delve further into Plenty More - Ottolenghi's recipes are Christmas staples around here, so we were excited to try a few new ones. We couldn't go past a couple of pretty classic Ottolenghi-style salads - a mango and curried chickpea salad (bottom of the picture above) and a parsley, lemon, cannellini bean and quinoa salad (top left). The quinoa salad was actually surprisingly straightforward for Ottolenghi - the usual array of shredded herbs (parsley and mint in this case, plus some coriander I threw in by mistake! ), a bit of quinoa, some beans, lemon and a few spices - it's really simple and pretty effective. The curried chickpea salad took a bit more work, even with the shortcuts we used (tinned chickpeas and pre-ground spices rather than soaked chickpeas and roasting and grinding our own). You've got onion to fry, cauliflower to blanch and fry and a whole lot of mango to slice up. The pay-off is worth it though - this is an excellent mix of sweet mango, spicy curry flavours and some nice charred cauliflower chunks (plus plenty of greens for freshness). We'll definitely be making this again. Our centrepiece though was the most time-consuming dish of the lot - roasted sweet potatoes with orange bitters (recipe below). It's actually not a lot of work, just lots of chopping and then an hour of roasting, with regular stops to stir things together. It's a phenomenally good dish - the glaze that you roast the potatoes in is a mix of sweet and bitter and it caramelises as it roasts, leaving the potatoes sticky and loaded with flavour. Throw in the infusion of deliciousness from the roasted garlic, sage and thyme and you've got a classic veggie dish that's destined to impress. The goats cheese in the recipe can be omitted without really diminishing the dish, so it's easily adapted for vegans. We had a lovely Christmas lunch - a few nibblies, some wine, sunshine and these three dishes is a winning combination, especially when followed up with a batch of these cream cheese brownies that Cindy whipped up for us. We've made our way through a lot of Ottolenghi recipes over the years, but he keeps coming up with brilliant dishes and will remain a regular Christmas visitor at our place. Slice the sweet potato into wedges, about 3cm wide and 15cm long. Combine the orange juice, vinegar and sugar in a saucepan and bring to the boil. Reduce the heat and keep it at a low simmer for about 20 minutes - you want the liquid to have thickened up and reduced by about half. When it's done, take it off the heat and add in the olive oil, bitters and a teaspoon or two of salt. Put the sweet potatoes in a large bowl, along with the garlic, chilli and herbs. Pour over the sauce and toss everything together so that it all gets well coated. Lay the mixture out in two lightly oiled baking trays - you want to try to get it all in a single layer, but it's not critical if things get a bit too crowded (see our pictures above). Roast for an hour, taking the pans out every 15 minutes to shuffle the potatoes around and make sure they're coated in the liquid. Ours dried out by the 45 minute mark so we added an extra splash of orange juice to each pan. Remove from the oven and let them cool slightly. Serve warm or at room temperature, dotted with the goats cheese and seasoned with salt and pepper. I was quite surprised to discover that it had been about two years since we last wrote a proper blog post about Wide Open Road. Since that post we've moved to a new flat not too far from Barkly Street and quickly made it our go-to local cafe option - I get coffee there all the time and Cindy and I regularly stop by to check out the seasonal menu changes. It's probably our own familiarity that has limited us to the occasional tweet and facebook post, but a couple of visits within a few weeks of each other this summer is a good excuse to remind our readers of this place's charms. It's a lovely space - a cavernous and stylish interior tucked away behind a fairly brutal industrial exterior. There are communal tables, bench seats, booths and regular tables, but they're all almost always full and on a weekend you'll almost never get a table without at least a few minutes of waiting around. In spite of the ridiculous turnover and seeming chaos of the place, the staff are relaxed, charming and incredibly efficient - it's a slick operation. The menu changes around semi-regularly and always has a bunch of vegetarian options available. They've stopped being explicit about dietary requirements on the menu these days, but there's a note clearly welcoming inquiries about which dishes can be done vegan or gluten-free. We had a couple of shots at the most recent incarnation of the menu. On the first visit I ordered fried eggs on sourdough with an avocado and black bean dressing and Asian herbs and chilli salad ($15.90) plus a gruyere potato cake ($5) on the side to share with Cindy. The potato cake was excellent - crispy and cheesy and completely indulgent, but it didn't really belong with the rest of this dish. The dish itself was incredible - the black bean dressing had a rich savouriness, while the noodle salad had crunch and a decent dose of chilli heat. Throw in half of an excellent avocado and two perfect fried eggs and you've got a really excellent and innovative breakfast dish. After she'd polished off her share of the potato cake, Cindy tackled her dish - local strawberries with whipped cream fraiche, praline and balsamic flakes on toasted brioche ($15). The toppings on this were great - a nice combination of sweetness and tartness - but the toasted brioche itself was like a thick slab of cake and difficult to share around those pretty toppings. I'm a big fan of the coffee that Wide Open Road serves up and Cindy reports that their chai is excellent as well - spicy and not too sweet. Our more recent visit was a lunchtime trip, specifically so we could try the fried cauliflower sandwich (with carrot jam, walnut labne, chard and herbs served on Rustica pumpkin bread, $15.50). It was an unwieldy sandwich - basically impossible to eat without taking it to pieces and using a knife and fork. The fillings were wonderful though - battered, deep-fried cauliflower florets, a mild labne dotted with walnut chunks and a lot of sweetness from the carrot jam. Between the soft sweetness of the pumpkin bread and the carrot jam, the dish was at the sweet end of the savoury menu, right where Cindy likes it. This was another spectacular dish - I highly approve of the practice of battering poached eggs and henceforth encourage all cafes to offer it as an option. The fuul itself was a little drier than examples we've enjoyed at Brunswick Foodstore and Half Moon Cafe, but was hearty and well spiced, with the mint and pomegranate providing some sharp freshness to cut through the rest of the dish. There's good reason that Wide Open Road is wildly successful - it's menu is innovative, varying and the food is consistently top notch. They do great coffee, are always playing excellent music and have a group of superbly effective and personable staff. It's a high-end breakfast (you're almost always paying $15+ for food), but they really justify the high prices in ways that lots of other cafes don't. They've got a reputation for being super vegan-friendly, but I'm not sure how the current menu works out - I'd be interested to hear about the experience of any vegans who have visited recently. Read about our previous visits to Wide Open Road here, here and here (and on Facebook here, here and here). Since our last blogging visit a couple of years ago, it has been positively reviewed by: The Good Hearted (back when WOR had more explicitly vegan dishes on the menu), The World Loves Melbourne, The Filthy Platen, Klaus & Fritz, melbourne brunch scene, Dale's Blog, The Owl's Nest, Mel: Hot or Not, I talk too much my mouth hurts, Doughnut forget me, Miss Muesli, Do You Want to Stay for Breakfast? and New International Students. There are a couple of less enthusiastic write-ups at Melbourne Food Snob and The Travel Journo. Accessibility: Tables outside are on a sloping footpath and there are a couple of steps up on entry. There's a fair bit of space inside, although they manage to squeeze plenty of tables in there. There's full table service. The toilets are tucked away out the back, are gendered and fully accessible.